Knowing how to increase your multilingual site speed is an important skill. Page loading speed is an often underestimated factor for the success of a website. However, it influences many key factors, like: traffic, bounce rate, conversions, user satisfaction, as well as SEO. This detailed guide will cover everything you need to know about how to make your multilingual WordPress site faster. We will go over why loading speed is so important, how to test the current state of your site and what measures you can take to increase your multilingual site speed. This is not just abstract information but influences real-world outcomes. For example, when Mozilla made its pages 2.2 seconds faster, it resulted in 60 million additional downloads of Firefox. In another case from 2012, Google found that when they slow down their search results by 4/10 of a second, they lose eight million searches per day. The same year, Amazon calculated that if their pages are just one second slower, it would net a loss of $1.6 billion in yearly sales. You can see that from a business standpoint, investing in fast loading site is absolutely crucial. The fact that users care about site speed means that search engines do, too. Since their goal is to provide users with the best possible search results, they don’t want that to be a dud that takes forever to load. For that reason, at least Google has gone on record that they are using site speed as a ranking factor. This also factors in for other things the search engine uses to rank websites, such as bounce rate. If users get bored waiting for your site to load and hit the back button, this will also affect your search standing negatively. So, if your goal is to rank well and gain organic traffic, making your site as fast as possible is absolutely crucial. So, how do you increase multilingual site speed? The first step is to test how fast it currently is. After all, you can only fix a problem that you know exists. Thankfully, there are some super useful tools that can tell you how your site is faring in this regard. The two I recommend are Pingdom and GTmetrix. Both can give you detailed information about how well optimized your website is and what measures to take to increase multilingual site speed. In addition, Pingdom allows you to test from several different server locations. This way, you can understand how visitors from further away experience your site. Alright, now that you know all there is to know about why speed matters and how your site is doing, let’s talk about how to make it faster. Where you host your site has great influence on how fast it loads. You can optimize your website all you want, if the server it lies on is chronically slow, the effects will be limited. For that reason, the first step in speeding up your multilingual site is to invest in quality hosting. If you are just starting out, shared hosting can be enough. There are some decent offers out there. However, especially after you have grown to a certain size, you are better off with a virtual private server (VPS), where you have dedicated resources. An alternative to that is to go with one of the many offers for managed WordPress hosting. Here, a lot of the day-to-day of running your site is taken off your hands, including performance optimization. It’s also a bit more expensive but can be well worth the price. If you are running a multilingual site in WordPress, your website is dependent on a number of different technologies such as PHP and HTML. These get updated regularly and the latest versions also often come with speed improvements. 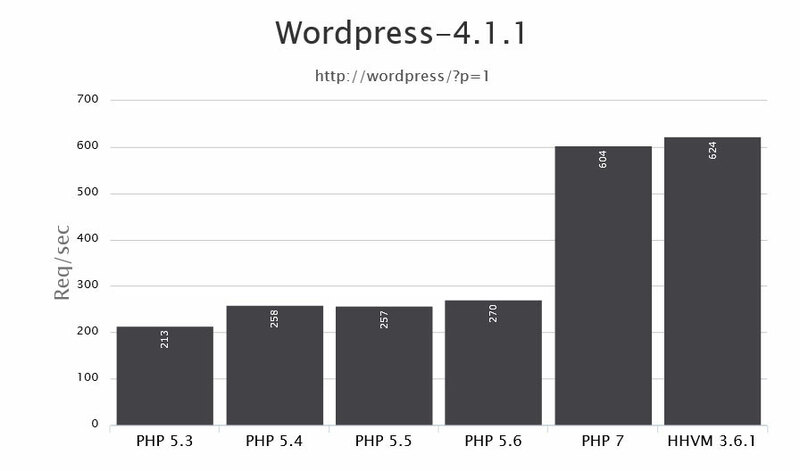 For example, performance has been a great focus for the last few versions of PHP. Not every host will automatically run the latest version. Therefore, read this post to find out how to check your PHP version and safely update it. However, be sure to check whether everything on your site is compatible with the new version version before you do. You can use this plugin for that. Your basic web technology is not the only thing that needs to be kept up to date. The same goes for the software running your site as well as its components. New versions of WordPress come with bugfixes, security updates and, you guessed it, performance improvements. To keep running at peak speed, make sure that you actually apply them. This will also fix any known security issues, which will keep your site safe from hackers. Keeping themes and plugins updated is all good and proper, however, it won’t make everything right if you have too many of them or if they are shoddy to begin with. Plugin excess and use of low-quality extensions are often big factors in site performance. Therefore, to increase your multilingual site speed it’s a good idea to limit yourself to only what you need. This can mean going with a lightweight theme instead of one that comes with “all the functionality”. Having only as many plugins on your site as necessary is another good idea. If you can eliminate some of them, by all means, do it. For the plugins that you do keep around on your site, make sure they are high quality and optimized for performance. 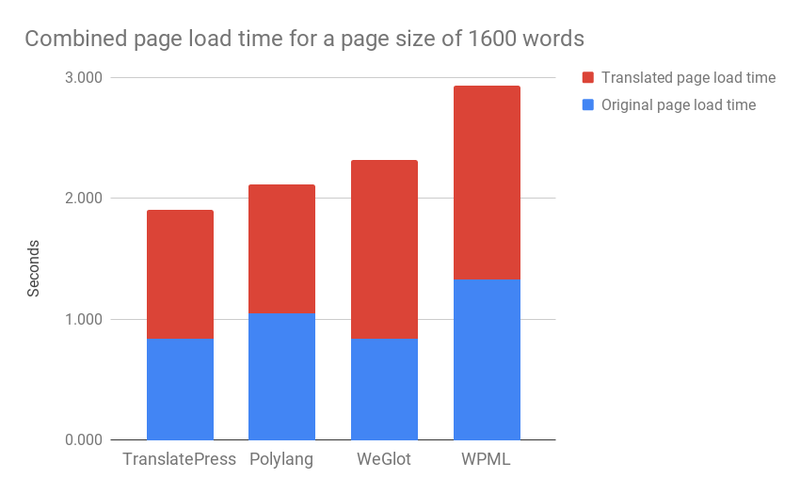 For example, there are big differences in the page load time of the most popular translation plugins. Since every second counts in keeping visitors around, this is nothing to scoff at. To find out which other components are slowing down your site, read this post. The WordPress database is where all your content is stored (including, if you are using TranslatePress, your translations). It is accessed every time someone wants to see your site. For that reason, if your database is slow, so is the rest of your site. Unfortunately, this part of WordPress tends to acquire dead data weight over time and needs regular maintenance to get rid of it. You can do this with plugins like WP-Optimize or Optimize Database after Deleting Revisions and there are more options in this article. Server requests happen anytime the browser asks to download something from the server. This can be an image, a style sheet or any other file. Naturally, the less that happens, the faster your multilingual website. There are many ways to reduce server requests. 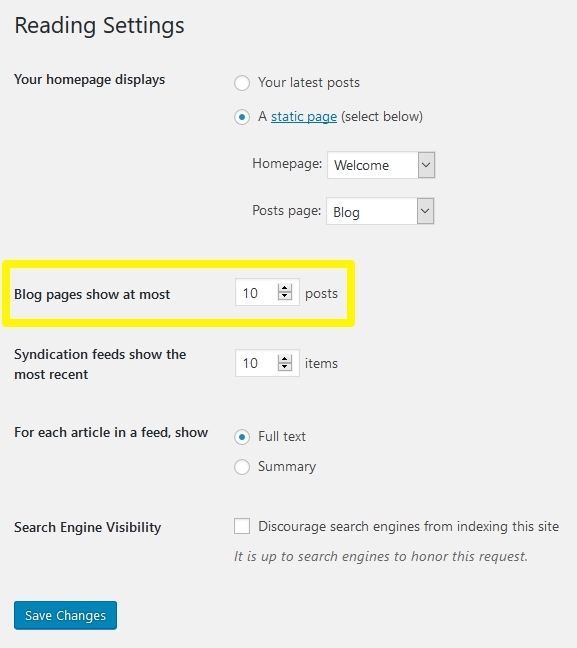 For example, you may limit the elements on screen by decreasing the number of posts on your blog page. You find this option under Settings > Reading. There are many more measures like that and you can read up on them here. Images regularly make up the majority of page weight. For that reason, they are prime candidates for optimization. The smaller your images, the faster they load. The first thing you can do to reduce their size is to compress images before uploading them. That means getting rid of unnecessary data without compromising quality. In Photoshop, there is the Save for web option to achieve this. Alternatively, there are online compressors like TinyPNG/JPG. Another option are plugins that automatically compress images at upload like WP Smush and EWWW Image Optimization, or services like Optimole. In addition, make sure to only use as large an image on your site as necessary. WordPress provides options for that for this exact reason. Caching means saving a finished HTML version of your pages on the server to send to visitor browsers. That way, they don’t have to generate it from scratch. This can save valuable time because it reduces the amount of communication with the server (requests, remember?). There are several plugins out there, the most popular being WP Super Cache, WP Rocket and W3 Total Cache. Aside from that, you are also able to enable caching manually. Whichever option you choose, it will go a long way in optimizing your multilingual site speed. Gzip compression is in a similar vein as caching. It works the same way as creating a zip file on your computer, just that it happens on your server (which is another computer). Compression leads to smaller files, which are faster to download and thus make your site faster. The caching plugins just mentioned above are able to do this automatically. Alternatively, you can enable compression manually by posting the following code inside .htaccess in your website’s root directory. Finally, I already mentioned that location can make a big difference in how fast a user can download your site files. Content delivery networks alleviate this problem by placing static website files in a network of computers across the globe. Then, whenever someone requests to see your site, they will receive them from the nearest location. There are several options out there such as MaxCDN and Amazon Cloudfront. Cloudflare even offers a free personal plan. If neither of those are for you at this point, consider using the free Photo CDN included in Jetpack. It will at least move your site’s images to a CDN. Site speed is an important topic for any WordPress website, multilingual or not. How fast your pages load influences everything from user satisfaction over conversions to ranking in search engines. Therefore, you should do everything you can to increase it. If you only implement a handful of these measures, you will already be ahead of many other websites. Plus, you can always invest some time here and there to make your site even faster. Do you have any other tips on how to make multilingual WordPress sites faster? Please let us know in the comments section below!